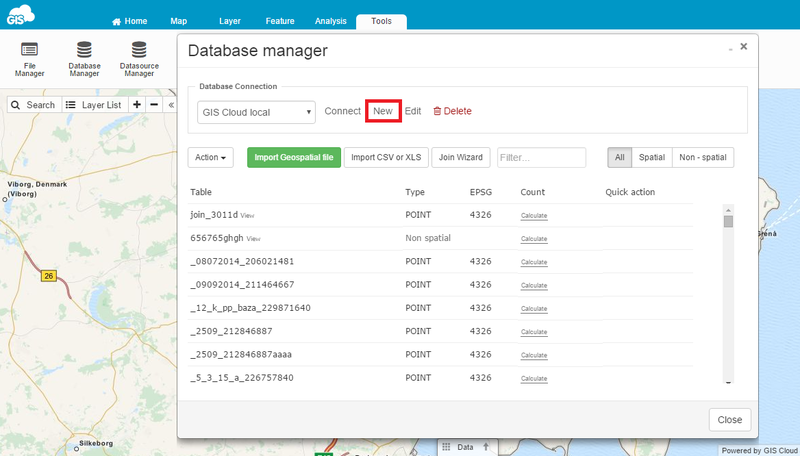 The Database Manager allows you to import layers into the database. After importing, database layer has to be added to a map. Database is the required data source for editing geometry and performing any data editing, calculations, or analysis. Database Connection – Enables database connections. For cases where the connection is not established choose Connect. Refresh – refresh table list. 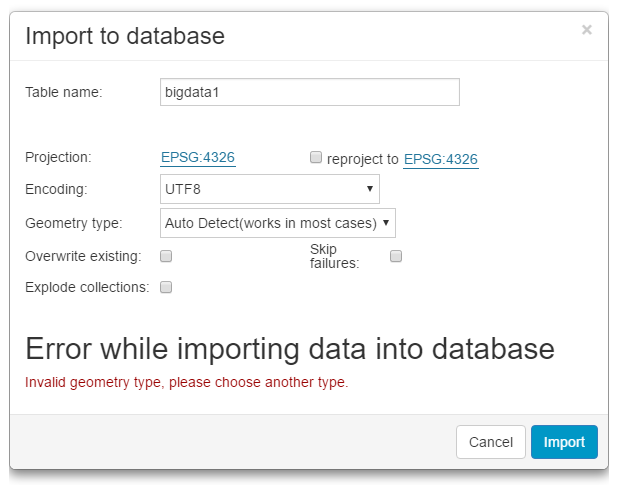 Select all – select all database elements. 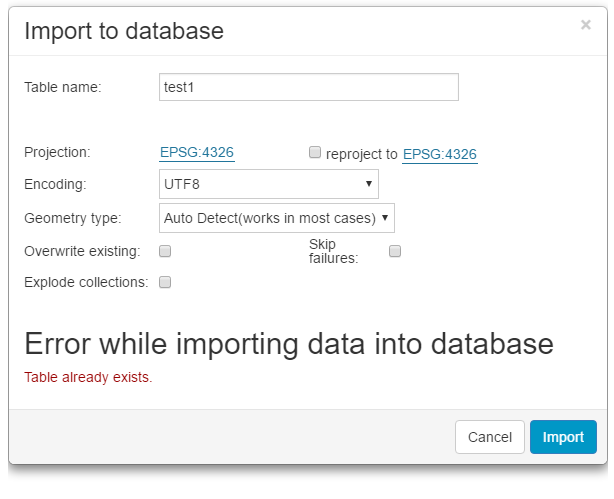 Unselect all – unselect all database elements. Rename – rename selected table. 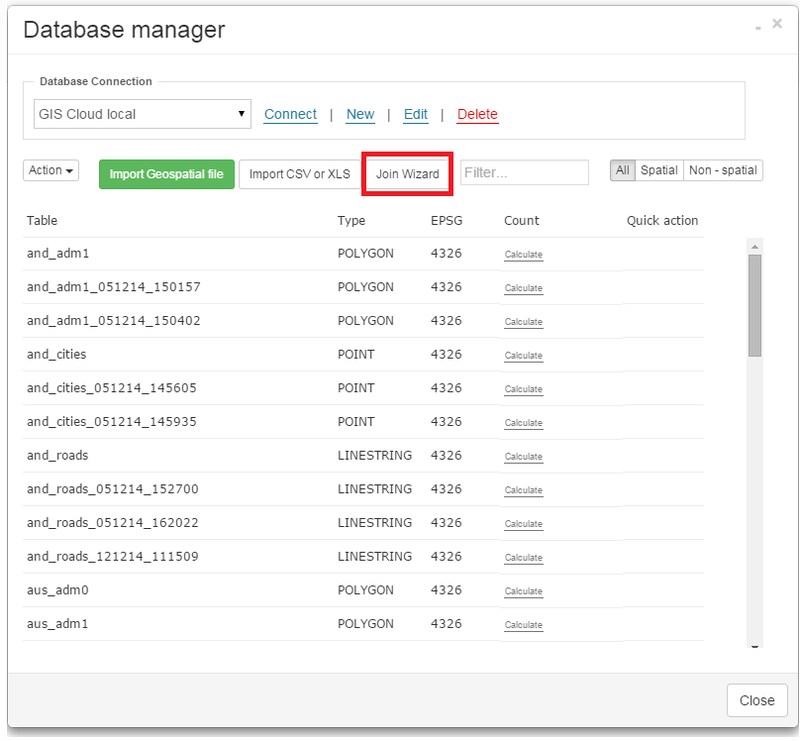 Duplicate – duplicate selected database elements. 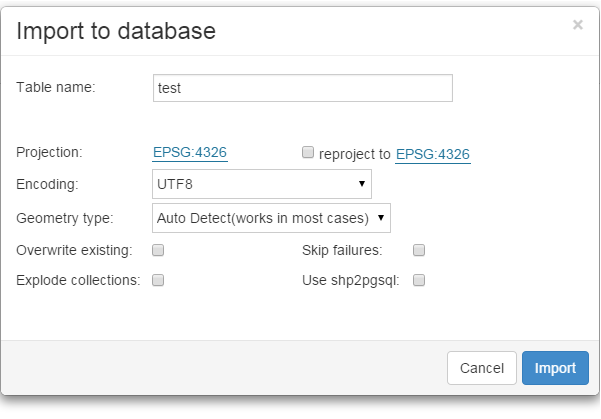 Reset – reset metadata cache of features etc from the selected tables. Truncate – truncate features from selected tables. Delete – delete selected tables. 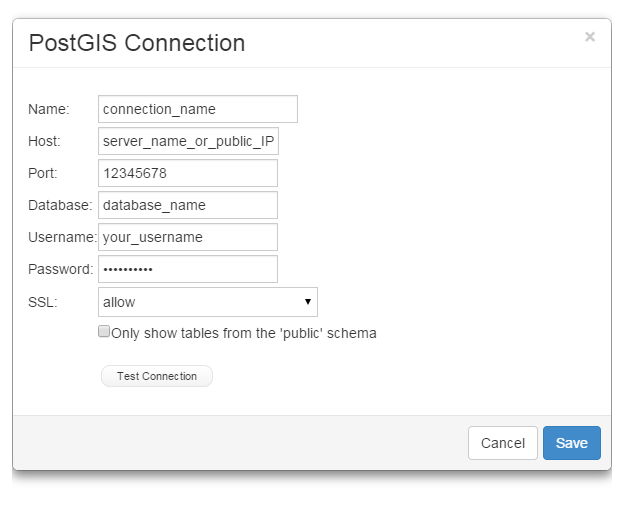 Import Geospatial file – Tool for adding layers into a database. 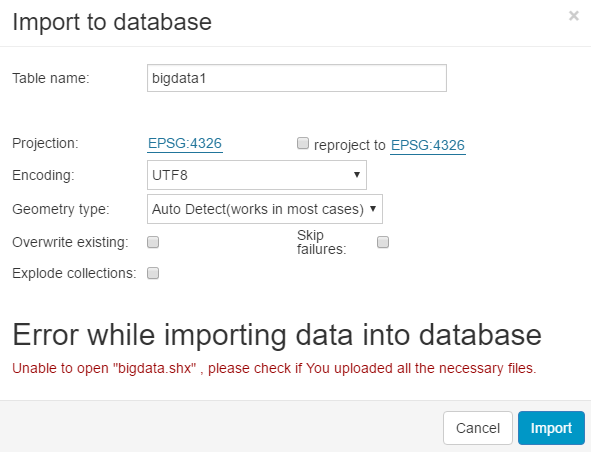 Import CSV or XLS – Tool for adding CSV or XLS files. Join Wizard – Tool for joining layers. 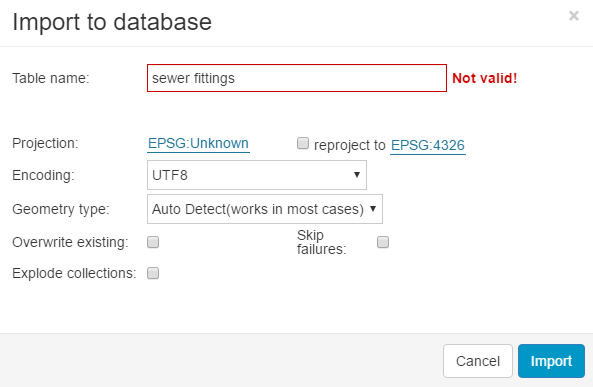 Filter – Enables database search. All/Spatial/Non-Spatial – Displays all or spatial/non-spatial tables. Calculate – Tool for counting number of the features in the selected table. Quick actions – when pointing mouse above layer displays Edit and Delete option. Note: the values in the table below serve as an example and are not the values you need to type to create your own database. private one (if your address is 10.x.y.z, 192.168.x.y, that won’t work). Username – this is the name of the database user that can connect to the before mentioned database. Note this option is case sensitive. Password – this is database password. Note that this option is case sensitive. SSL (Secure Socket Layer) – Set the desired level of connection security from the dropdown menu. 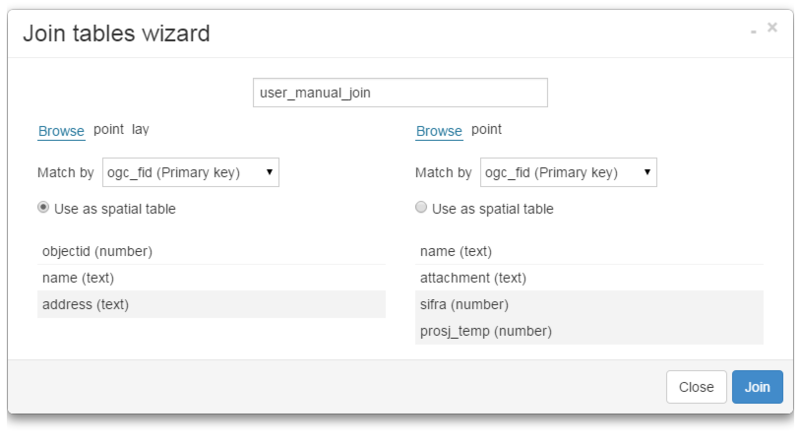 Scheme – By enabling this you choose to see only public schema tables. the primary key should be named ogc_fid. An auto-incrementing (or serial) column, as opposed to a regular numeric column, is used to ensure that each inserted row gets an automatically generated unique ID (FID) value. Note: To preform join, layer must reside in the Database. 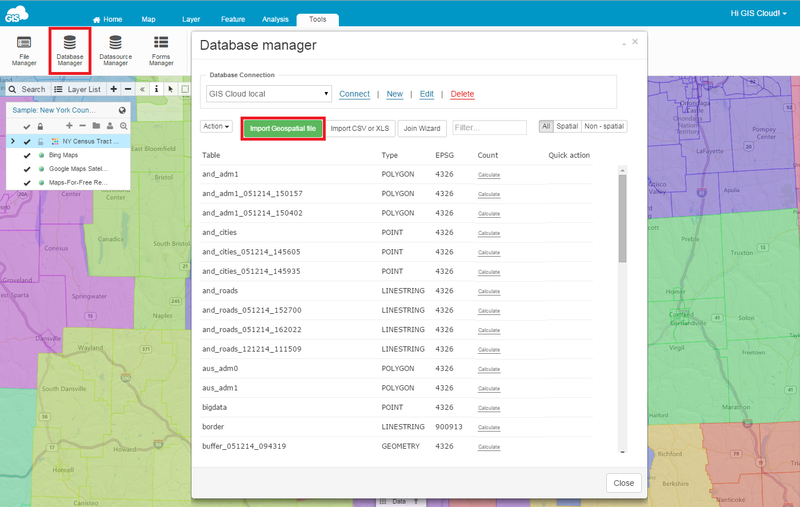 Creating a new layer with combine attribute data from two separate layers can be done with Join Wizard. Browsing for layers which will be included and choosing their attributes defines joining result which is saved in the database. 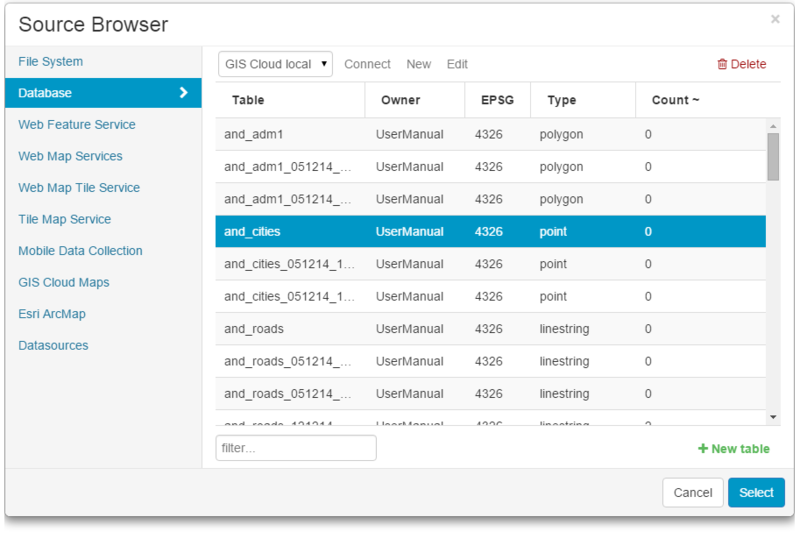 Open Database Manager from the Tools tab. Type in the name of the layer which will be created as a result. Browse first and second layer out of which join will be made. Choose which layer will be source for geometry takeover (use as a spatial table). Select which columns will be added to the result. Note: make sure that layers don’t have same column names, with the exception of the column on which join is based. It can have different or equally named column in the both layers, but it’s crucial that it has matching data, unique for each feature.